Our Price: $905.00 Free Shipping! Global's Sirena Leather Lounge Chair-3371LM features fully upholstered, fixed non-removable seat cushions. 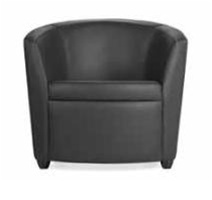 This modern looking club chair makes a welcoming statement for reception areas, meting rooms and private clubs. Round style feet are available in Black only. Ideal for reception areas, meeting rooms and private club use. Our Price: $475.00 Free Shipping! Our Price: $645.00 Free Shipping! Our Price: $669.00 Free Shipping!